Urethane Mixer Arm Guards – Impact Resistant! 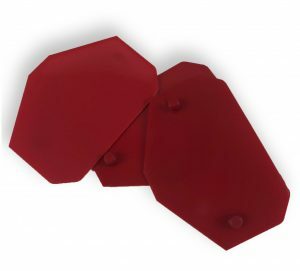 Urethane Mixer Arm Guards have always been in high demand over the years and they are one of the numerous top quality polyurethane products we manufacture at Plan Tech. To ensure that our urethane mixer arm guards are always of world-class quality, we only make use of raw materials that offer the best quality available. Other factors that stand all of our urethane products apart from those of other brands in the sector include our fully equipped state of the art in-house machine shop, our exceptionally talented team of engineers as well as our application of speed and precision during manufacturing. Using our state of the art mixing machines, our experts are capable of casting urethane mixer arm guards of any shape, size or hardness. And our polyurethane mixer arm guards can be relied upon to excellently resist abrasion, wear, and chemicals. The Mixer Arm Guards we produce at Plan Tech are also capable of withstanding temperature extremities and harsh environmental conditions. With our over 30 years’ experience of producing the very best of urethane products, you can count on us to perfectly handle your rubber mixer arm guards project from design to completion. Bring your sample, sketch or idea to us and let us wow you with our unbeatable expertise. For over 30 years we have focused on using speed and precision to manufacture the highest quality industrial cast urethane parts to our customers. A particular strength is the breadth of our in-house capabilities such as urethane compression molding and grinding urethane parts which, when combined with our extensive experience, enables us to deliver tight tolerance custom urethane parts while maintaining the quality control and cost effectiveness our customers require. The tests are performed according to an established set of standards provided by an accredited testing organization such as the Society for Testing and Materials (ASTM) who define the procedures in detail. Are you interested in cast Urethane Mixer Arm Guards? Please Contact us so we can help solve your requirements and work with you on your specific application!